Life on earth is a living experience. Let the death of Yee be a valuable lesson for many others who come after her. Yee was 40 years old when she was diagnosed with breast cancer in October 2005. She underwent a mastectomy. It was a Stage 2 disease with no lymph node involvement. The tumour was 3 x 2 x 2 cm in size. After surgery, Yee received 6 cycles of FAC chemotherapy (5-FU, Andiamycin and Cyclophosphamide). No radiotherapy was indicated. Chemotherapy was completed in March 2006 after that she was started on tamoxifen. Yee was well for about 9 months. Sometime in January 2007, she noted a swelling in the right side of her neck. A CT scan of the thorax on 19 January 2007 indicated: multiple nodules scattered in both lung fields ranging from 2 to 10 mm. This means the cancer had spread to her lungs. Yee was given 8 cycle of taxane-based chemotherapy. This treatment was not effective. CT scan on 4 July 2007 showed the nodules in the lungs were progressing. Yee received more chemotherapy – 6 cycles of Navelbine + Herceptin. This treatment cost about RM 50,000. CT scan in November 2007 showed stable disease. From November 2007 till December 2008 Yee was on the oral drug, Tykerb (lapatinib) 4 to 5 tablets per day. Each tablet cost RM 65.00. At RM 260.00 per day this medication cost RM 7,800 per month. It seemed that the total cost for about 14 months on Tykerb came to about RM 93,000.00. By February 2008, failures started to show up again. A CT scan on 13 February 2008 indicated:enlarging pulmonary nodules ranging from 0.5 to 2.2 cm. Six months later, 19 August 2008, CT scan indicated pulmonary nodules are increasing in number and measure from 0.5 to 5.0 cm. Subcentimeter mediastinal nodes are also seen. fibrosis in the right axilla. an irregular ill-defined node in the right infraclavicular region, approximately 2.0 cm. another small right supraclavicular node, 0.7 cm is also present. medistinal nodes,size slightly increased from the last CT examination. pulmonary masses and nodules are enlarging. The largest mass, in the left lung is currently 5.6 cm. Other lesions measure from 1.0 to 4.8 cm. A new hypodense lesion, approximately 1.0 cm is now seen in Segment 7. This is suspicious of liver metastasis. In view of the progressive disease, Yee underwent 28 times of radiation treatment starting 13 October 2008 until 1 December 2008, while at the same time continuing with her oral-drug, Tykerb. On 17 December 2008, York suffered headaches and was unable to sleep. 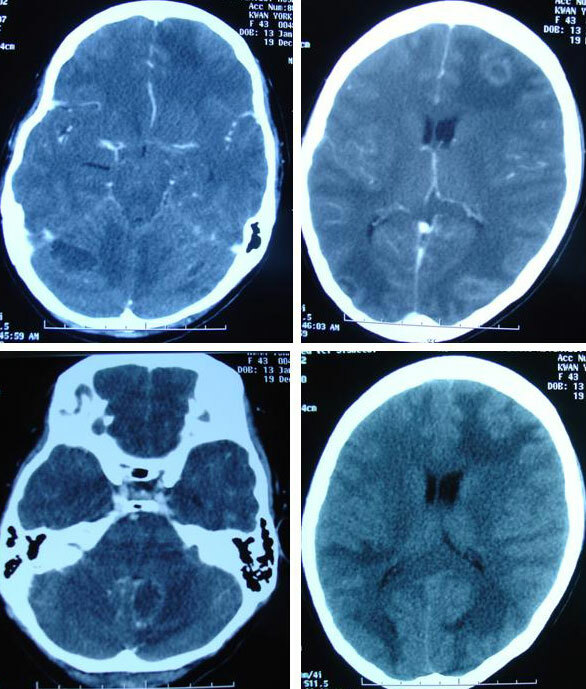 A CT scan done on 19 December 2008, indicated multiple brain metastases. Yee and her husband came to seek our help on 5 December 2008. Yee’s condition was serious. Her right arm was numb. She had no appetite. She was severely breathless. Even the supply of oxygen to her nostrils did not help at all. She told her husband she would rather die. In early February 2009, Yee was admitted to the hospital where the doctor suggested that she receive radiation to her brain. It was not to be – she died even before the treatment. This is a tragic case. Yee’s story is similar to that of Fransiska of Indonesia. Fransiska underwent surgery and received chemotherapy, radiotherapy, Herceptin and Tykerb + Xeloda. Fransiska died. She was diagnosed in November 2004 and died in December 2008. Yee was diagnosed with a Stage 2 breast cancer in October 2005, underwent similar treatments and she died in February 2009. Doctors, the media and patients always look to newer drugs and newer technologies as a new hopefor treating illnesses. We have been hooked and made addicted to the idea that something new is always better. Herceptin and Tykerb are new bullets for cancer which are now beginning to appear in our local landscape. Are they better or dangerous? There is no cure for metastatic breast cancer. But it can be treated. What do you by such a vague treatment? Surely we can treat anything if there is money! Some women may develop liver damage while taking Tykerb. The cause of this damage is not known. Liver damage may be severe and may cause death. The most common side effects of Tykerb are diarrhea; vomiting; feeling sick to your stomach; feeling tired; red, painful hands and feet; and rash. Dry cough or have shortness of breath may be signs of inflammation in the lungs. 1. Herceptin can cause heart muscle damage that can lead to heart failure. 2. Herceptin can also affect the lungs, causing severe or life-threatening breathing problems. 3. Herceptin can cause allergic reactions that can be severe or life-threatening. Symptoms of a reaction include a drop in blood pressure, shortness of breath, rashes and wheezing. 4. Because of these potentially life-threatening side effects, doctors are WARNED to evaluate patients carefully for any heart or lung problems before starting treatment. Do you think they ever do this? In this case, Yee had metastasis (that is not severe problem enough?) to her lungs. As such would Herceptin not make things worse for her? When she came to us she was severely breathless. What could have been the cause? Dr. Ralph Moss wrote a report entitled: Herceptin or Deception. Michael Janson, M.D., past president of the American College of Advancement of Medicine gave this comment about the report: Dr. Mossreveals the hollow core of the recent medical reports on Herceptin, showing that it is not what has been claimed, and that the statistics were manipulated to make it seem far better that it is, while underplaying the potential risks. In Yee’s case, like in many other cases before her, perhaps there is no point asking the same question: What has gone wrong? Things seem to go wrong most of the time. Allow me to think aloud:How could a Stage 2 breast cancer kill a patient within four years? Would she have died if she was to do nothing? Breast cancer is less common among those in their thirties, but if breast cancer occurs in younger women, it tends to be more aggressive than in older women. While this may be true, some people want to make us believe that it is because Yee was young and had an aggressive type of cancer that make her treatment ineffective. Let me invite you read the case of three ladies who were before forty when they had cancer yet they survive. The only thing they did differently was that they did not blindly their doctors – they declined chemotherapy, radiotherapy or hormonal treatments. Tee, a 38-year-old lady who was diagnosed with breast cancer in October 2005 (note: at about the same time as Yee) and she refused chemotherapy. Tee is still alive as of this writing (March 2009) while Yee died in February 2009. You can read Tee’s story in our Case Report series. Sue was 39 years old when she discovered 2 lumps in her right breast in 2003. She underwent a mastectomy. Her oncologist told her that with chemotherapy she would have 5% chance more of survival. She but declined further medical treatment, including tamoxifen as suggested by her surgeon. Sue change her diet and lifestyle and took herbs. It has been 6 years now and Sue has been leading a trouble-free life. Julia discovered a 4 cm lump in her breast in 1995. She was then 36 years old. She was asked to undergo a mastectomy. She declined and never went to see her doctor again. She declined chemotherapy, radiotherapy or hormonal therapy and decided to seek alternative healing. She father is an herbalist and naturally she turned to him for help. Julia’s healing journey along the uncharted path is interesting and sometime dangerous. But to fact remains she is still very much alive and well as of this writing (2009). It was 14 years that she was first diagnosed with cancer. The detail story of Julia is found in our book: The herbal option, Chapter 3. Cindy was 34-years old when she was diagnosed with breast cancer in August 1994. She underwent a lumpectomy. Since the margin was not clear she was asked to undergo a mastectomy to be followed by chemotherapy and radiotherapy. She declined further medical treatment. She changed her lifestyle and diet, did qi gong and meditation and sought homeopathic therapy. It has been 15 years and Cindy has been leading a healthy without any problem (Chapter 2: The herbal option). Dr. Gershom Zajicek, Professor of Medicine at The Hubert H. Humphrey Center For Experimental Medicine and Cancer Research, The Hebrew University of Jerusalem, Israel (http://www.what-is-cancer.com) wrote: Modern medicine has the best means to treat disease, yet the basic tenets of treatment are false. Dr. Frank Daudert, Pro Leben Klinik in Austria said: Doctors are blindly giving chemotherapy … while the cancer cells smile. Doctors give chemo, chemo, chemo. And patients die, die, die. In their book: More harm than good, Alan Zelicoff, M.D., and Michael Bellomo, J.D./MBA, wrote: (Physicians are) taught that doing nothing almost guarantees that the patient will suffer and that doing something outweighs doing nothing. The truth is that the vast majority of cancer – once spread – remain incurable despite the availability of many dozens of new chemotherapeutic drugs and even the use of antibodies directed against cancer cells. Richard Deyo and Donald Patrick, professors, University of Washington, Seattle, USA, wrote in their book: Hope or hype – the obsession with medical advances and the high cost of false promises: We are born with our own blind trust in a medical establishment that preys on our deepest fears, all the while purporting to ride to our rescue with “miracles cures.” Indeed many medical advances do offer real advantages but there are as many others that offer little, if any, advantage and many have alarming side effects … marginally effective at best – and sometimes downright dangerous …. They often lead to useless, harmful and unnecessarily expensive care … When doctors introduce new products good money often trumps good science. This entry was posted in Breast Cancer, Failure Story and tagged breast cancer by CA Care. Bookmark the permalink.